Dietz Bakery in Fredericksburg, Texas is no more. To most people outside of Texas, this probably won´t mean very much. But, to anyone who ever had a slice of that bread fresh from those decades-old ovens, and to those who ever waited in line to get that freshly baked donut, cinnamon roll or sausage roll, June 30, 2010, is a day that will always be remembered when we lost an icon of the community that can never be replaced. It probably seems a little odd that I´m posting a story about a bakery from my hometown. After all, I´m an international traveler and always looking forward to my next travel adventure. News of the bakery´s closing spread like wildfire. And, people felt like they had lost a close family member. Frankly, over the past month, I´ve been pondering why those of us that knew the Dietz Bakery had such an emotional and visceral reaction to losing this cultural icon of Texas. After all, there are other places to get bread, right? In Bogota, Colombia, where I now live, there are at least a dozen bakeries in a five-blog radius from my apartment where I can get freshly baked bread and sweet treats. On June 30, I met up with some friends from high school to get in line to bid the bakery ¨Auf Wiedersehen.¨ Truth be told, I like many others, had already put an order in earlier in the week to make sure we got our favorite treats one last time. But, there´s always been something about standing in that line, smelling the bread and the warm glaze anticipating that first bite, trying to control the hunger. We weren´t first in line, even though we arrived at 6:40AM, but we were second. Dietz Bakery had what every business wants: loyal customers, passionate for its products. Why? Dietz wasn´t the only bakery in town. And, the others have great products as well. But, no other bakery in town had the same level of commitment from its customers that Dietz had. Again, why? I think any kind of food product has the potential to create an emotional bond with its customer. Food attacks all of our senses. The experience is visual, tactile, olfactory and, often times auditory. And, Dietz Bakery certainly had all of these elements. The Smells: The first thing to hit you upon entering was the combination of the smell of the bread and pastries wafting from the ovens and cooling trays. The decades-old metal fans, used to cool the bread, help circulate the intoxicating, mouth-watering aromas out the front door. The Sight: Next, there was the look of the pastries displayed in the glass case so that you could start looking immediately to see if they still had what you wanted. Even a newbie could see that these products were freshly baked. The Sounds: The sounds of Dietz were a mix of the old fans cooling the bread, the old slicer cutting a fresh loaf for a customer waiting for it and the tape dispenser spitting out branded labels to close off the freshly wrapped loaves. The Touch: Next came the feel of that fresh bread, or maybe a warm cinnamon roll or donut. The products were soft to the touch if eaten immediately. And, if left too long, the lack of preservatives was apparent as the bread and pastries dried up. But, that wasn´t anything that a microwave or toaster couldn´t fix. The Taste: And, finally, there was that unique Dietz taste of its products. I´ve come across some bakeries that had similar-tasting products. but, nothing came close. There was always the satisfaction knowing that what you were eating was freshly made, handmade, homemade, just like your Oma (grandmother) would´ve baked. As I thought about Dietz´s legacy, it dawned on me I never really had to do without Dietz´s products. They were closed two days a week, but from Tuesday through Saturday, Dietz was there. Name the wedding or large event in town, and it was likely that Dietz bread was served. Until the day it closed, Dietz was Fredericksburg. Dietz was there at your birthday, your anniversary, your wedding and numerous community BBQs and fish fries. In doing so, It was part of the fabric of the community in a fundamental way. But, Don and Marcia decided a long time ago that they were only going to make a certain amount of product a day. And when that sold out, that was it. No more. That philosophy created a situation in which we felt like the product was ultra-limited. It didn´t matter that you could call ahead, pre-order or simply arrive on-time. Dietz sold out almost EVERY DAY. Once they sold out, Marcia hung its famous ¨Sold Out¨ sign apologizing for the fact that there was no more to sell. That created a belief that the product was scarce and therefore, superior. Like I said before, there were other bakeries in town. But, you could get their products any time of the day. But, not Dietz´s. You knew that if you wanted something from Dietz, you had better be on your game. In a world where mass production of our food supply has given way to faux-fresh products (freshly baked frozen dough, doesn´t cut it), Dietz stood alone. You knew that those products were made by Don´s hands every day. The lore is that Don arrived to the bakery around 1AM, and to the sounds of classical music, he made the daily ration of bread and pastries by hand until the day it closed. Who does that anymore? And who from my generation is willing to do that? Rather than relegate Dietz to anachronistic status, it made Dietz even more special over time. Using those same ovens from the 1950s, Don and Marcia made a pure, simple, well-made product day after day that stood the test of time. They didn´t try to get too fancy and follow whatever cooking fad was in vogue. Food has always been an integral part of my travel experiences. I think about the first piece of unpasteurized French cheese I had in Paris, the red wines I enjoyed on my travels throughout Chile, Argentina and Uruguay, the arepas (corn cakes) and patacones (twice-fried plantains) that I love here in Colombia, the exotic dishes (whose names I´ve forgotten ) I had in Turkey, and even enjoying my first Tim Tam slam last year in Australia. Despite all of those foodie adventures, I´ve never forgotten the Dietz Bakery. And, I like many from Fredericksburg, Texas, never will. A fund raiser for the Pioneer Museum, The Roots Music Series is a series of five live, open-air eclectic Roots music concerts on the grounds of the Pioneer Museum on Main Street in Fredericksburg, Texas. Concerts feature both emerging and established artists in an informal, family setting. Each month brings a different genre of music with three performers a night. 6 p.m. The Little Elmore Reed Blues Band – a group of Austin’s best blues musicians – starts the evening with Chicago blues, Texas style. This will be a rare performance for the band that normally plays only on Monday nights on east Austin. The members all work in other bands, but they come together to play their unique sound that combines Chicago blues, west coast swing, early rock, and New Orleans cool. 7 p.m. Lisa Marshall brings on the Rhythm & Blues. Her vocals evoke Aretha Franklin, Gladys Knight, Mavis Staples and Janis Joplin. And her band is hard driving, gut busting, and funky. 8:40 p.m. Leeann Atherton – another Texas belter – finishes up with a steamy sound that blends gospel, folk, and blues and runs from Billie Holliday ballads to Etta James grooves. Once again you can get a $9 meal that includes choice of 12 oz. rib-eye charbroiled and cooked to order on site, Shrimp Ettoufee, and Gumbo in a bread bowl, with sides of dinner roll, butter, new potatoes, corn on the cob plus dessert. 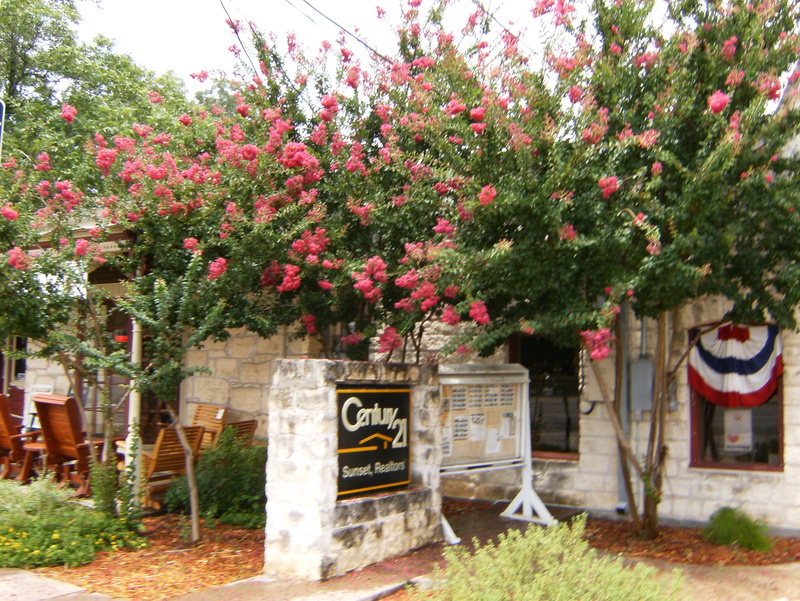 The Pioneer Museum is located at 325 West Main Street in Fredericksburg, with entrance gate on Milam Street. Bring lawn chairs. All concerts take place on Saturdays, 6 – 10 p.m.
Gates open and food is served beginning at 5 p.m. Kids under 17 are free. Upcoming Concerts are Aug 21 – Texas Country Night; Sept 25 – Latin/Conjunto Night. 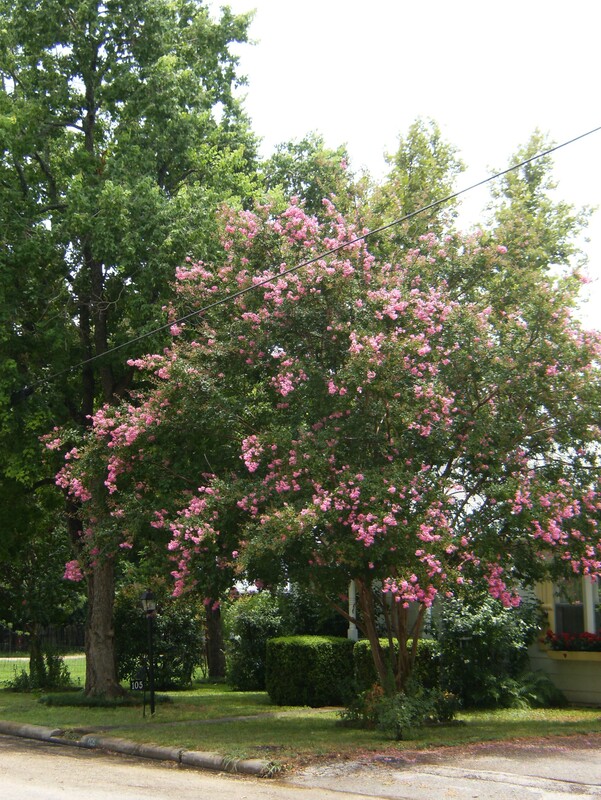 Have you noticed how gorgeous the Crape Myrtles are this year? During Fredericksburg’s 150th Anniversary celebration in May of 1996 the committee decided to do a beautification project. My mother, the late Erna Dietel Heinen, and Peggy Metzger’s mother, the late Audrey Schuch were the chairmen. 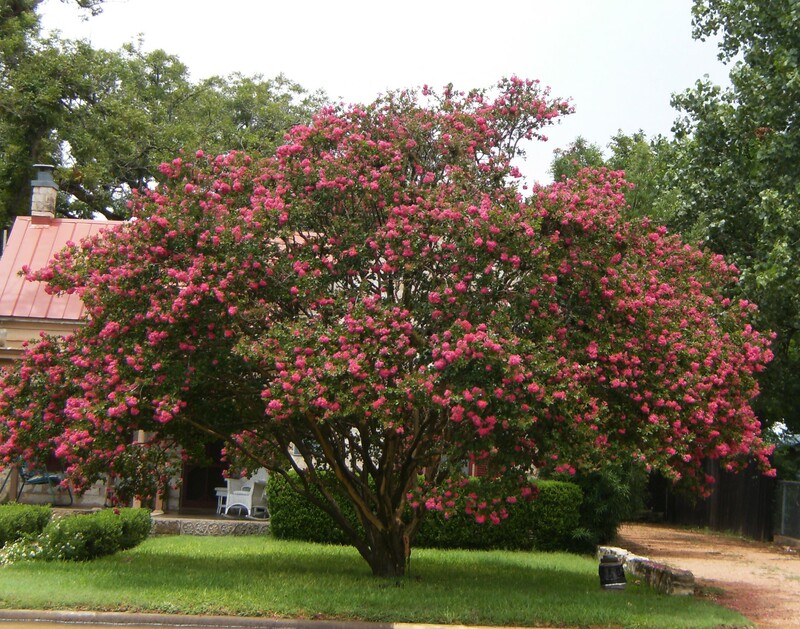 They decided they wanted to make Fredericksburg the Crape Myrtle Capital of Texas. 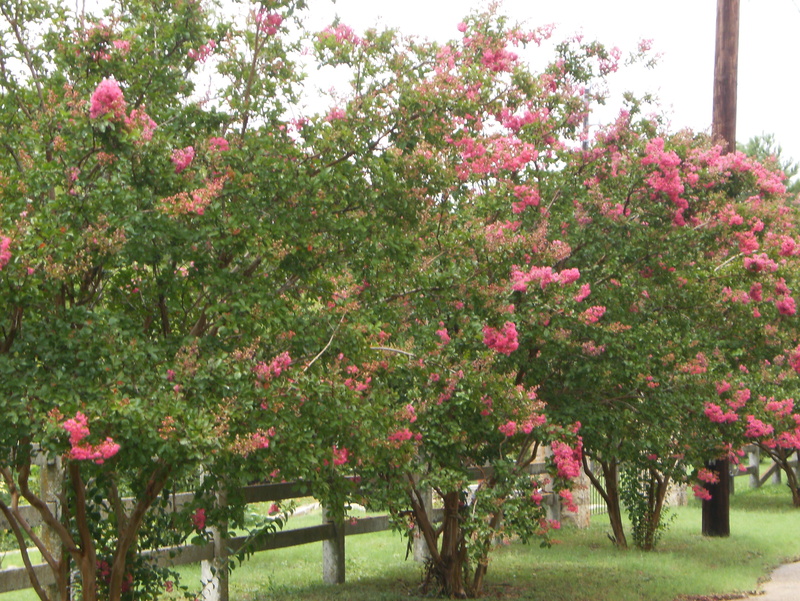 They had a very successful sale of Crape Myrtles, and our community has benefited from their foresight. 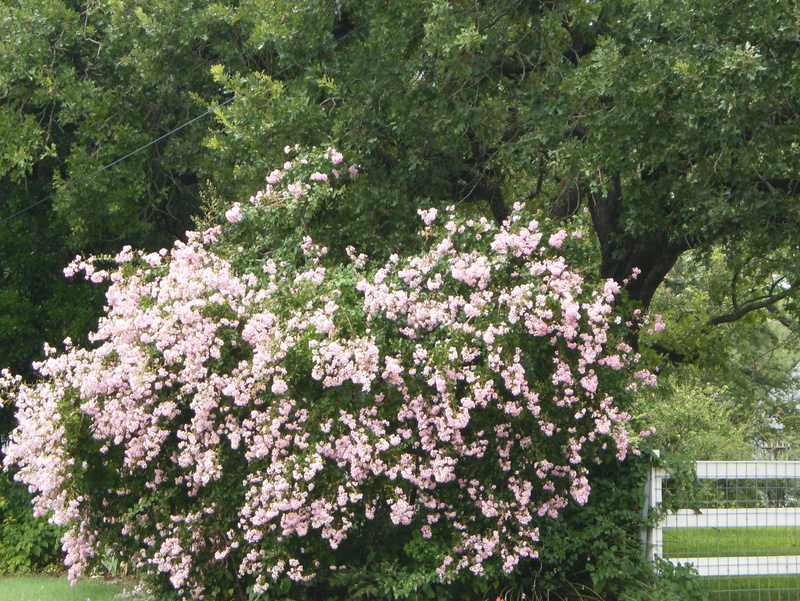 If you drive down most any street in Fredericksburg you will see stunning “Meusebach Red”, Pink and Lavender blooms. The towering trees with their magnificent colors adorn so many yards and line streets and businesses. You will also see picturesque shrubs blooming. 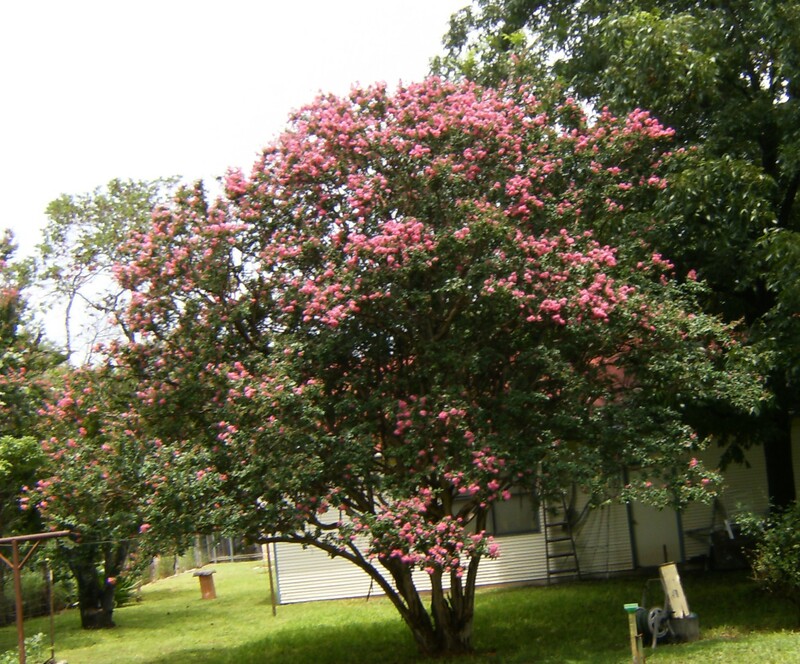 If you want to plant some Crape Myrtles this is a suggestion for beautiful blooming flowers. 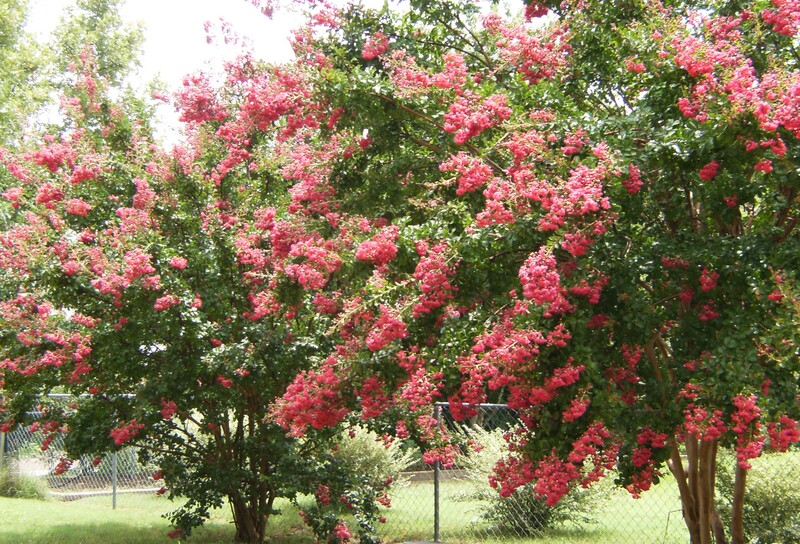 For strong growth and abundant flowering, plant crape myrtle in full sun. Heavy shade will reduce growth and flowering and will increase disease problems such as sooty mold on the foliage and powdery mildew on the flower buds and young growth. 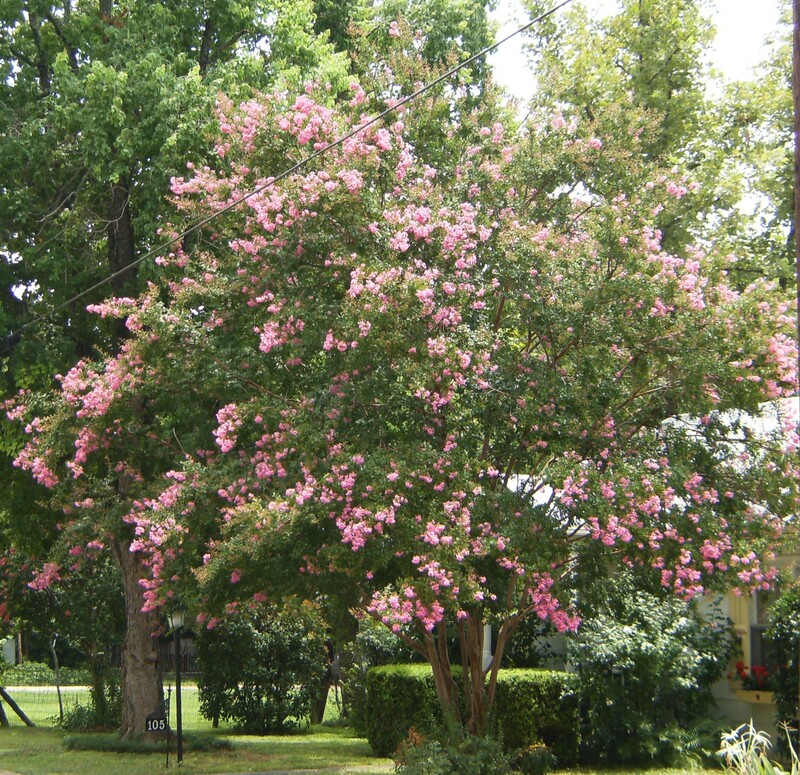 Large shade trees will also compete with the crape myrtle for moisture, causing poor growth and flowering. Lack of sunlight and moisture are the common causes of poor growth and flowering.